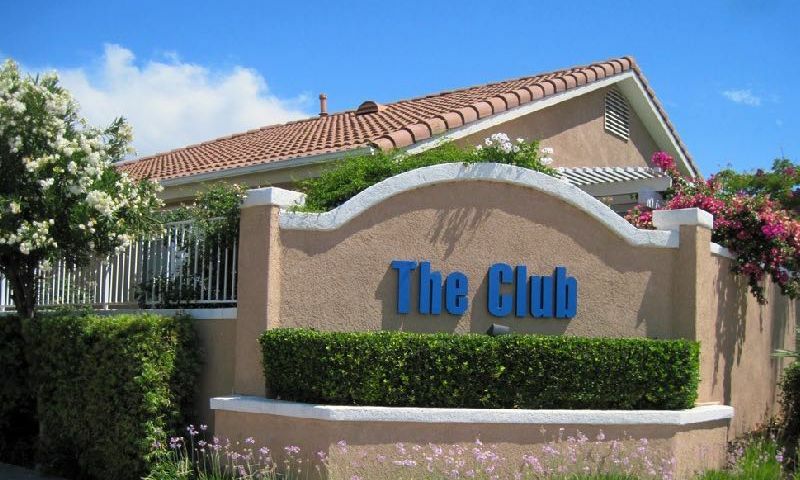 The Club is a 55+ community located in Menifee, California. The community is comprised of 259 residences in a private, gated setting. It is an ideal community for buyers who want an intimate active adult neighborhood near the heart of Sun City and its surrounding attractions. The Club is located west of Interstate 215 off of Barnett Road and Rouse Road. Residents can access Orange County, Los Angeles and San Diego all within an hour and a half. The Club is an ideal community with single-family homes in the Inland Empire area for today's active homebuyer. There is an exciting array of amenities and social activities available to the residents of The Club. The well-appointed clubhouse is the central hub for community activities. Residents can stay in shape in the exercise room, get creative in the arts and crafts studio, enjoy a book in the library or play a game of billiards. There is even a ballroom with a stage that is perfect for hosting parties. Outside, homebuyers can take a dip in the outdoor pool or soak up the sun on the patio. The shuffleboard courts, horseshoe pits, tennis and basketball courts are the perfect places to challenge a neighbor to some friendly competition. Lennar began construction of The Club in 1994 and by 2000 it was completed with 259 single-family residences. Most homes feature two to three bedrooms, two bathrooms and an attached two-car garage. Each home was thoughtfully designed with open floor plans, plenty of natural light and spacious master suites. The Club is an age-restricted community for adults aged 55 and better. The Club provides an active and low-maintenance lifestyle for its residents. The Club offers a lovely small-town feel where residents can make lifelong friends. Residents can establish fun neighborhood events and activities based on common interests and lifestyles. The Club is located off of Barnett Road and Rouse Road in Menifee, California. Homeowners have access to several shopping centers and stores such as Lowe's, Target and Kohl's. Throughout the surrounding area there are also many restaurants to please every taste bud including Red Robin, BJ s, Coco's and Texas Roadhouse. Diamond Valley Lake Reservoir and Lake Elsinore are located nearby and offer great boating, fishing and gorgeous views of the surrounding mountains. For those who want to venture farther, a world of culture and outdoor recreation awaits. The Club is located near I-215, which provides quick access to the surrounding attractions of Southern California. Within two hours from home, residents can explore Orange County, Los Angeles, the San Gorgonio Mountains, and Joshua Tree National Park. With boundless amenities and a fabulous location, it s easy to see why The Club is a sought after active adult community in Menifee, California. There are plenty of activities available in The Club. Here is a sample of some of the clubs, activities and classes offered here. I've been a resident here for over 14 years now, and after looking at many of the other communities, this fits my budget, lifestyle and comfort. People here are the friendliest and the volunteer opportunities abound! Lots to do, caring folks and wonderful staff too. For what you get The Club is a really good value. The amenities are pretty nice and the location is good. We're close to all the big-box chain stores and restaurants. The highway is easy to access so you can get to LA or Orange County pretty easy too, if you really want to that is! I'd prefer to stay local. 55places.com is not affiliated with the developer(s) or homeowners association of The Club. The information you submit is distributed to a 55places.com Partner Agent, who is a licensed real estate agent. The information regarding The Club has not been verified or approved by the developer or homeowners association. Please verify all information prior to purchasing. 55places.com is not responsible for any errors regarding the information displayed on this website.